Training giant Evocca College has sacked 220 staff (out of 770) and will close more than a third of its campuses around the country. It comes after about 200 staff were let go in October, 2015. In a statement, the college said 17 “smaller” campuses are to be closed, affecting about 900 of its 11,000 students. Affected students have been told they can transfer to nearby campuses or study online, or a mixture of both. There have been a number of college closures around the country after the Commonwealth government cracked down on rorting of the VET-FEE-HELP “study now, pay later” loans. In its statement, the college said less than 10% of students would be affected and it was only closing smaller campuses. Evocca College chief executive Craig White said the “restructure” was a response to the “well-publicised changes” to the VET-FEE-HELP sector that took effect on 1 January. A workforce reduction is always the last resort and Evocca College has taken every possible step to minimise the impact of the changing operating environment on our staff. The changes we are making are regrettable but unavoidable, and are aimed at ensuring we remain a financially robust vocational education provider and that we continue to provide high quality and innovative education and outcomes for our students. We realise this is a difficult time for our staff and we will be supporting those affected by offering employee assistance programs and outplacement services as part of a separation package. Evocca came under scrutiny last year, for allegedly dubious recruitment practices. It received around $200 million under the VET Fee-Help scheme last year, making it the second-largest recipient after Careers Australia. Evocca had a completion rate of 22.4% in 2012, meaning only 550 of the 2460 students who enrolled that year had graduated two years later. In the three years since then, Evocca has grown its enrolments more than fourfold. 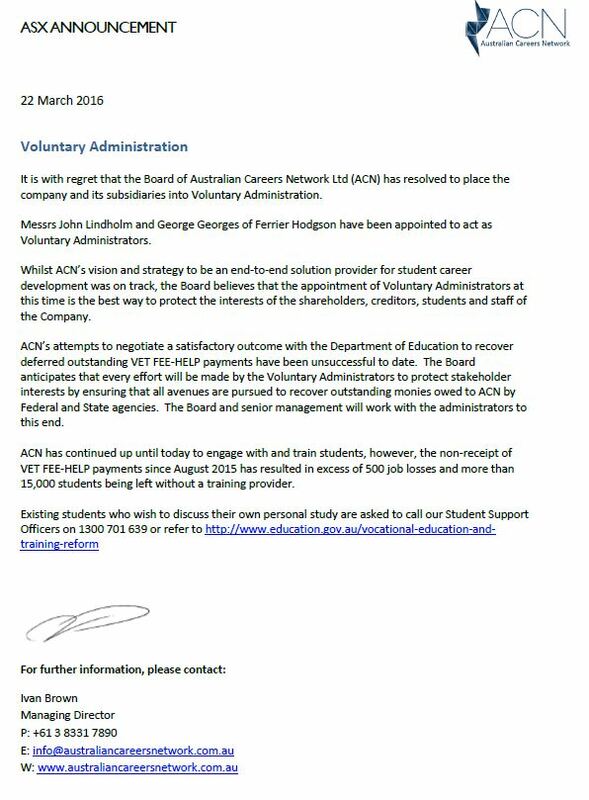 Evocca’s restructure follows the collapse of other private training providers including Aspire College and its subsidiaries, while Phoenix Institute, Unique International College, Cornerstone and the Australian Institute of Professional Education, other large recipients of VET FEE-HELP funding, have had their registrations cancelled by ASQA and are being pursued by the ACCC in the Fedral Court for “unconscionable conduct”.